If you're a fan of movies, film making, screen writing, or other aspects of film, then visiting a film location in PA is a great idea! See for yourself where some of your favorite films were filmed, and maybe even catch some live filmings! A unique day trip idea, these film locations in PA are a guaranteed hit. A Perfect Tour for Movie Buffs! If you're a fan of films and movies, then you can absolutely not miss out on the Philadelphia Movie Sites Tour! You will see more than 50 movie sites from 30 movies and TV shows filmed in Philadelphia during this 2.5 hour tour. A certified tour guide will guide you through Philly while you relax in a luxury bus with a large flat screen TV so you can view film clips during the tour. Whether you take a group tour or a private, personal tour, you will see sites from such iconic movies as Rocky, Marley & Me, Transformers, National Treasure, Jersey Girl, the Sixth Sense, and so much more! Take a ride through Philly on the best movie sites tour offered! 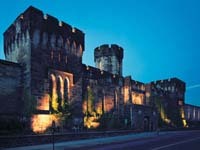 When you plan a visit you don't usually want to go to a prison, however, the Eastern State Penitentiary in Philadelphia, PA, is a former and famous jail and film location. Not only was it one of the locations where 3 movies were shot but it also hosted famous criminals. The movies in which we can see this former prison are: Transformers Revenge of the Fallen, 12 Monkeys and Return to Paradise. As for the famous people incarcerated here, you might only want to hear Al Capone or Willie Sutton. The visiting hours are from 9 AM to 5 PM, every single day. It's not bizarre to see churches or monasteries in movies and one of the churches featured in “The Sixth Sense” and in the “Shooter” movies, is the St. Augustine's Church in Philadelphia, PA. Both the interior and the exterior of this old church have been used for both of these films, so you might feel like on a movie set when visiting. There's a Mass held every day of the week, as follows: Monday to Friday at 12:05 PM, on Saturdays at 5:15 PM there's a Vigil and on Sundays there are 3 Masses held, at 9 and at 11 AM and at 5 PM. The Philadelphia City Hall in PA is one of the film locations where several movies, 5 of them, were filmed, thus this is a must see destination. Some of the movies filmed here are: Transformers: Revenge of the Fallen, Philadelphia and Blowout. Being a public institution, its doors are open Monday to Friday between 9 AM and 5 PM, while it's closed on weekends. Philadelphia's City Hall is a National Historic Landmark and this is probably the reason why it has been included in the filming locations for several movies. For many, there's no place like the Hard Rock Cafe. The one in Philadelphia, PA is special as this is one of the film locations for the movie “Jersey Girl.” You all know that this is a restaurant, a bar and it has a merchandise store as well, so you have a good excuse to come visit and even have some fun. The opening hours for the bar and the restaurant are between 11 AM and 11 PM from Sunday through Thursday while on Friday and on Saturday it closes at 12 AM. The merchandise shop opens one hour earlier. The Academy of Music in Philadelphia, PA should be visited for more than one reason. For starters, this is the Pennsylvania film location of the "Age of Innocence" movie. The Academy is the host of daily ballet and orchestra events, as well as fashion shows which can be watched in a gorgeous and intimate setting. One of the Academy's main attractions is the beautiful 5,000 pounds crystal chandelier, which has been renovated in the past years. It's opulence and rich history attracts visitors from all over the world. Philadelphia's Old City District in PA is the film location where several scenes of the movie “Beloved” where shot. Visiting this area, you will either feel like you are in the movie or transported to a different time and place. Philadelphia's Old City District has more attractions to offer to its visitors, one of them being the Independence Hall. This being a public area, it can be visited at any time while paying no fees. The only time you have to pay, is if you will want to drink, eat or shop around. The Old Pine Church graveyard in Philadelphia, PA must be a "National Treasure"
Maybe a cemetery is not on all the tourists' maps as a place to visit, but the Old Pine Church graveyard in Philadelphia, PA must be one of them. This cemetery was featured in the movie "National Treasure" and this is not the only reason for which you should visit. You can visit the graves of some 22 sea captains, of a signer of the U.S. Constitution, Revolutionary War soldiers (over 50 of them), stones masons and more. Make sure to have an appointment if you want to visit this PA film location. The Rittenhouse Square Park in Philadelphia, PA, is the best place to visit on a lazy Sunday afternoon. The park is surrounded by numerous architectural buildings and has been used as a filming location for blockbuster movies like The Happening and Rocky 2. Located in an affluent neighborhood of the city, Rittenhouse Square Park is the host of many exhibitions and small festivals. You can sit on a bench and watch the kids play while drinking your morning coffee, or visit one of the many upscale shops located on Walnut Street. A very elegant restaurant in the city of Philadelphia, PA is Butcher & Singer and as if this wasn't enough to make this location famous, scenes from “The Sixth Sense” movie were also shot here. Being a restaurant, one can come have lunch or dinner here, but the serving hours are quite strict and you will most likely need a reservation. You can make one with up to 60 days before you visit. Situated in Ritterhouse Square in the downtown area of Philadelphia, the restaurant cannot be missed and is surrounded by several other touristic attractions. There's no other place quite like the Famous 4th Street Delicatessen in Philadelphia, Pennsylvania. This well established film location in PA was the place to see people and to be seen, ever since the 1920's. However this location may be more famous these days as the place where some movies have been filmed, such as "Philadelphia" in 1993, "Jersey Girl" in 2004 and "In Her Shoes" in 2005. This location is open daily starting at 8 AM through 9 PM. As proof you've been there, make sure you purchase a tee or an apron, available only in the store. Philadelphia's Italian Market is a great place to enjoy Italian food and grab a salad, but not only that. The popular PA market is a film location, and movies like Rocky and In Her Shoes have been shot here. This is the oldest outside market in the US, and is open Tuesday to Saturday, from 8 AM to 4 PM. On Sundays the market closed at 1PM. Visitors can take part in the Food Festival event every year on May 18 which brings together vendors and cuisine from all around the world.